Best Hunting Compasses – 2019 Review Pointing Toward Our Top Picks! Any experienced hunter will always have some navigational guide in his or her survival pack. Sometimes we can rely on technology too much. The nifty, top-of-the-line GPS in our phone or watch can’t help us if it loses signal or the power dies. You should always keep a basic, low-tech compass in your go-bag, just in case. We’ve reviewed the best hunting compasses on the market in 2019 that will make a great accessory for any hunter. A compass is a device used to identify your location. A typical magnetic compass has a needle that is attracted to the Earth’s magnetic pull (or magnetic north). Using a compass, you can identify north (and the other cardinal directions south, east, and west). This can help you if you get lost in the woods or an unknown area. Compasses range from low-tech to high-tech devices that use the Earth’s magnetic pull or satellite signals to find your location. Did you know? The device has been around for over 2,000 years! It dates back to ancient China. Using naturally magnetized metals, the Han dynasty invented the compass as a way to predict the future. By the eleventh century, the Chinese turned the first compasses into a navigational tool. They kept sailors from getting lost at sea because it allowed the crew to find their way without relying only on the stars. Through trade, the use of the compass spread to Europe – without it, Europeans probably would never have reached the New World. 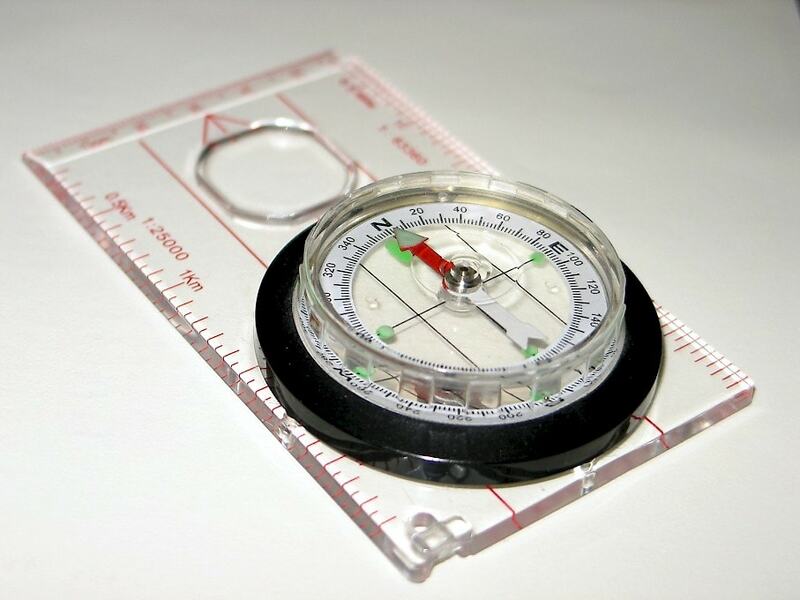 There are several types of compasses on the market today. 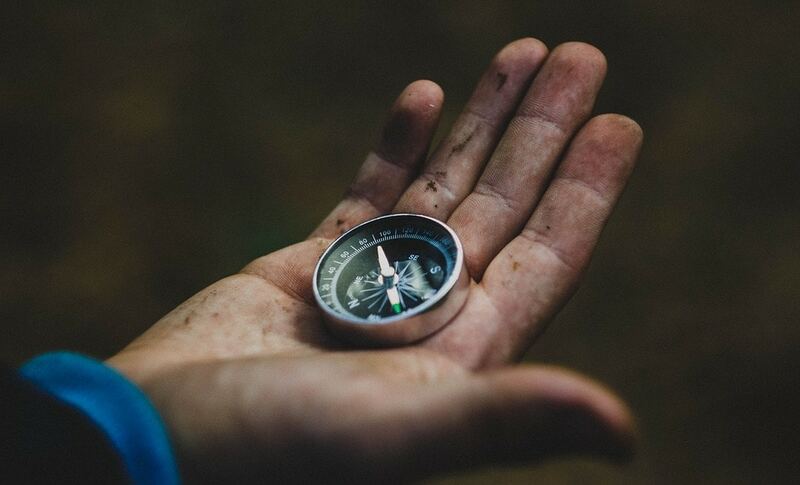 If you are purchasing your first compass, or you don’t know much about them, the decision process can be completely overwhelming. We’ve broken down the main types for you, so you can get an idea of what kind you need. We have also included a chart for easy reference. Although our review focuses on the two most common types of magnetic compasses (the lensatic and the floating needle models), the other designs may prove useful for hunters, depending on your comfort level, experience, and preference. The military uses this type for navigation. This magnetic compass opens up to lie flat on a map to chart your course. It has a lens on it that helps you read the device in areas of low visibility. This is helpful if you get lost at night, during a storm, or if you are in foggy conditions. The floating needle compass is one of the most common magnetic versions. The needle lines up with the Earth’s magnetic force, pointing north. Liquid – usually oil or alcohol-based – slightly weighs the needle down to make the reading more accurate. The device works the same way as the floating needle, except it doesn’t have the fluid inside the needle cavity. These require more of a steady hand or a level landscape to get the most accurate reading. Floating needle types have largely replaced dry compasses, but both are still available. The GPS compass (also called a satellite compass) collects information from satellites that orbit the earth. This information records your location. As you move, the GPS keeps marking your location. Using these readings, it can create a bearing. This type only works if you are in an area where it can read the satellite. If you have a phone or a watch with a GPS app, then you have a solid-state compass. These use electronic magnetic sensors inside the device to measure the Earth’s magnetism to find your location. They provide incredibly accurate readings, but they rely on the power source of the device to work correctly. A military grade magnetic compass with an extra lens that helps you read it in areas where is it hard to see. Best for hunters who are lost in a storm or the at night. A magnetic compass with fluid in the chamber to slightly weigh the needle to get a more accurate reading. A magnetic compass without the fluid in the chamber. Need to make sure it is completely still to get the most accurate reading. Uses satellite coordinates to read your location. Doesn’t work if the satellite can’t read the GPS’s location. Incredibly accurate, but they are inside of a device. If this device loses power, the compass will not work. Your Compass is a Magnet. Keep it Away From Anything That Has a Magnetic Charge. The needle is magnetized to line up with Earth’s magnetic north. Any contact with other magnetized items can ruin the magnetic charge, making the device less accurate. Any items in your go-bag or your vehicle – like your radio or your cell phone – can change the magnetic charge of your needle. Is Your Compass Weatherproof? Exposure to the Elements Can Ruin a Compass Without This Protection. Most products on the market have some protection against the elements, but are you getting the best for your money? Make sure that your device stands up to all of the elements. Look for metal or high-grade polymer materials that offer shatterproof protection. Also, any compass that is resistant to water, wind, sand, and extreme hot and cold temperatures will keep your instrument working exactly when you need it. How Heavy is Your Compass? In a Survival Situation, Every Ounce Counts. Most are lightweight enough to carry in a pocket or a go-bag. However, with all of your other survival gear, will your compass weigh you down? When shopping around, try to find the lightest device that has all of the features you want. We suggest not carrying one that weighs any more than a pound. It doesn’t sound heavy, but it matters if you get lost in the woods! Can You See Your Compass in the Dark? Make Sure Your Orienting Lines, Magnetic Needle, and Direction of Travel Indicator Glow in the Dark. If you get lost in the woods at night, will you be able to find your way? Many of these products are light-activated, so you can make sure you are still headed in the right direction in the dark. Depending on the device, you can charge the glow-in-the-dark features by natural or artificial light (like a flashlight). This is an important feature that you don’t want to be without because it might save your life if you get lost during a severe storm or after the sun sets. And, Most Importantly, Do You Know How to Use Your Compass? Before you bring your compass on your next hunting trip, learn how to use it. Read the directions that come with your instrument, and consult the several YouTube videos available on the subject. Always be prepared to use it, even if you don’t have to. Now that we’ve covered the different compasses and how important it is to have one on your next hunting trip, let’s get to it! We’ve rated and reviewed the best hunting products on the market today. Whether you are in the market for yourself or the avid hunter in your life, you’ll be able to find the perfect tool on our list. For over twenty-five years, Cammenga has supplied survival and navigational gear to the global market, including the military. At only 6.4 oz, the Cammenga 27CS Lensatic Compass is a lightweight yet durable product designed to get you out of the trickiest situations. The aluminum frame is basically indestructible and it is temperature proof from -50˚F to 150˚F. Unlike other floating needle versions, the Cammenga 27CS has a copper induction damping system. This weighs down the needle for more accurate readings without fluid in the chamber. The bezel rotates in both directions to set your heading, and the compass has measurements in both degrees and milliradians to get a more concise reading. The best feature is the cardinal points and the needle glows in the dark when activated with natural or artificial light. Only a few minutes of exposure will give it about an hour of glow, helping you find your way at night or in extremely dark areas. Despite the company’s claims that this is military-grade strength, there have been some complaints that it isn’t as durable as it claims to be. However, with such a high accuracy reading of +/- 0002 mils, the Cammenga 27CS Lensatic Compass is definitely the device you want to have with you if you get lost in the woods. Although Eyeskey is a company that mostly manufactures optical instruments, they offer a small selection of reliable products. 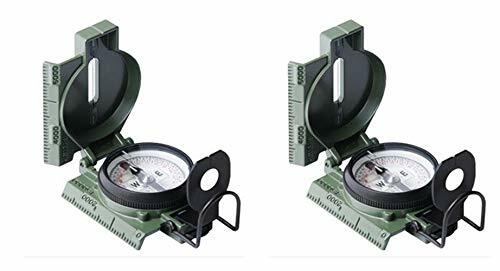 The Eyeskey Multifunctional Military Army Compass is our runner-up for the best hunting compass for its sophisticated features in a budget-friendly package. This has an aluminum alloy casing that is waterproof, shatter-resistant, and climate-proof. This particular product features a floating needle, with a thermoelastic liquid in the chamber that won’t freeze even in extremely cold temperatures. A hole in the base lets you place it on a tripod for steady reading. Light activates the outer dial to glow in the dark. This model includes a chart for angle, gradient, and distance conversions on the back for extra convenience in your calculations. Unlike other lensatic compasses that have a flip-up optic, the Eyeskey has an adjustable diopter sighting lens built into the unit – similar to that used in rifles. It also comes with an 18” lanyard and a carry pouch for easy storage while you are finding your way. Although the Eyeskey Multifunctional Military Army Compass is a great tool to have at your disposal if you get lost on your next hunting trip, it does have a few drawbacks. It advertises itself as a military grade compass, though it lacks the flip-up optic and mil readings of most lensatic compasses. At eight ounces, it feels a little heavier than other models. The outer dial lights up in the dark, but the needle is either very dim or doesn’t light up at all. While there were some complaints that the readings were off, these were relatively minor. Although we don’t recommend the Eyeskey for night use, it makes a great product for day use. The Proster Professional Compass Metal Waterproof IP65 is very similar to the Eyeskey model with a slightly better design. For that reason, it is our editor’s pick for the best hunting compass. This budget-friendly lensatic floating needle model includes a clinometer to measure slope and height differences if you are lost in rugged terrain. The aluminum metal case is water-resistant and shake-proof, with a conversion chart listed on the back. Unlike the Eyeskey, the Proster IP65 lies completely flat on a map, with measurements along the edges in inches and centimeters. This helps you plot your way to your nearest destination after you use the rotating bezel to set your heading. The Proster has an adjustable diopter sighting lens with a folding thumb ring so that you can comfortably read the device by resting it against your cheek. If you get lost at night, the needle and the compass card glow in the dark – the longer it is exposed to natural or artificial light, the longer it will glow. The Proster Professional also comes with a carry bag and a rope for easy transport during your hunting adventures. We like the Proster Professional Compass Metal Waterproof IP65 more than the Eyeskey version because it has the same survival features that you need in a sticky situation without so many drawbacks. While it does give accurate readings, the Proster needs to be completely flat to do so. At 11.2 ounces, it is one of the heaviest on our list. However, the Proster compass’ accuracy and durability make it a valuable tool to have with you on your next hunting trip. 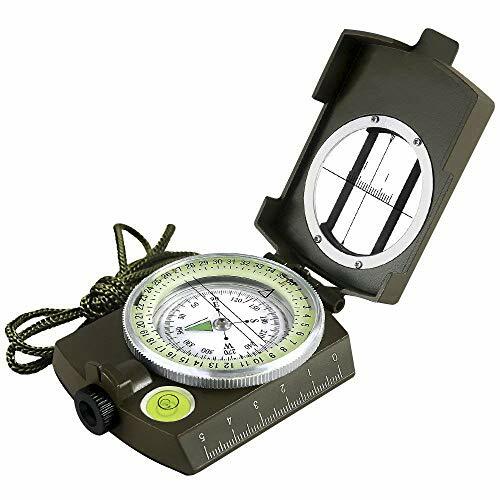 If you’re looking for a budget-friendly alternative, the GWHOLE Military Lensatic Sighting Compass has many of the same features of their more expensive counterparts. This lensatic compass is a floating needle with a screw hole on the bottom for mounting on a tripod. This gives you the option for an even more accurate reading. Like the Proster, the GWHOLE has a sighting lens and a foldable thumb ring to read it by placing it against your cheek comfortably. This model has a shake-proof camouflage metal casing that is resistant to most weather conditions, with a conversion chart for distance, gradient, and angle on the back. The GWHOLE also has a glow-in-the-dark capability. The longer that it has access to sunlight or artificial light, the longer that the needle and the card will illuminate in the dark. This product comes with an 18” lanyard attached for looping it around your wrist or neck, as well as a storage pouch for when you aren’t using it. While the GWHOLE Military Lensatic Sighting Compass is extremely budget-friendly, it isn’t exactly a precision instrument. It has all of the benefits of a non-military grade lensatic model, but the measurements are a few degrees off. This isn’t a device you would want to use in a survival situation. However, the low price makes it an excellent tool for teaching. 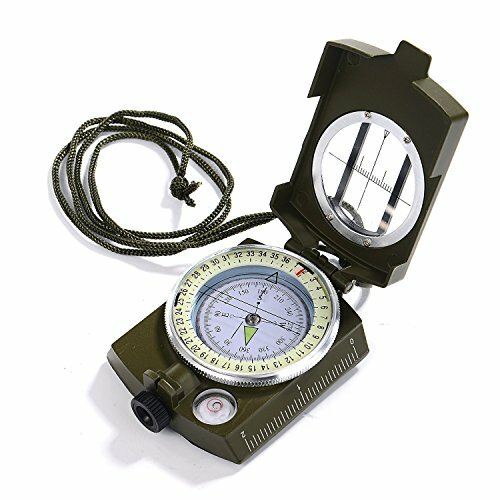 You can use it to instruct your children how to use a compass in a survival situation or for basic navigation. If you do bring this one on your next hunting trip, make sure you have a back-up navigational aid. When you look in your go-bag, you always have a survival knife and a compass. What if you could combine those two tools into one? The Amazon Jungle Survival Knife with Sheath does just that. This survival knife has a compass in the handle that might be useful if you get lost. The compass detaches from the hollow handle where there is a stored survival kit. The kit includes a fishing hook and line, needles and thread, a safety pin, matches, and striking paper. While the compass on this knife is very basic, the most impressive feature of this item is the blade itself. The stainless steel sawback blade is corrosion-resistant, and it is useful for quick cutting and trimming that you would use in any hunting or survival situation. The reaction to the Amazon Jungle Survival Knife with Sheath is about 50/50: people either love it or they hate it. 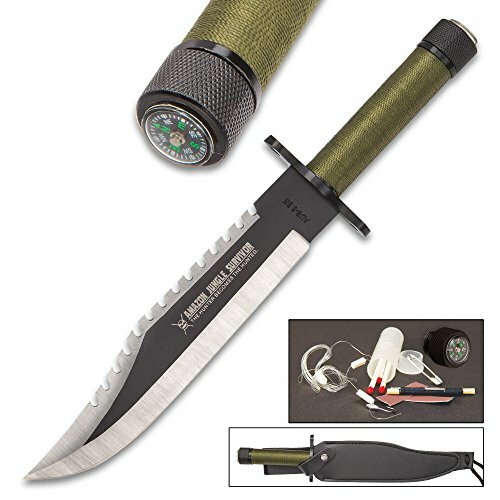 It’s more like a novelty item than an actual survival knife. The construction is pretty flimsy and won’t hold up to any intense use, but it has a quality, stainless steel blade. The compass is nowhere near the precision you would need to get out of the woods – you could use it for basic direction only. However, this would make a great joke gift for the avid hunter in your life. When you are lost in the woods, you are only as good as the tools you have with you. You’ll never find your way out without a quality compass to guide you. Having a durable product that delivers precision readings can potentially turn a dangerous situation into a story you can tell your friends about over a beer later. Keeping a compass with you – and knowing how to use it – is essential for any serious hunter. Even though you can’t feel it, the Earth has a natural magnetic force: our planet is pretty much like one big magnet. Just like any magnet you’ve used in science class, the Earth has two poles: a magnetic north pole and a magnetic south pole. Since opposite poles are attracted to each other, the magnetic needle is drawn to the Earth’s magnetic north. No matter where you are, if your compass is working correctly, it will always point north. When you look at your compass, you will see lots of markings on the card. These will help you read your compass when you are trying to find your way. The card has the four cardinal directions – North (N), South (S), East (E), and West (W). It also has markings for 360 degrees, which will help you find your bearing. Hold your device straight and level in front of you. The needle will move and point towards the north. Rotate the bezel ring to line up the orienting arrow with the needle. This will orient your direction of travel in relation to north. 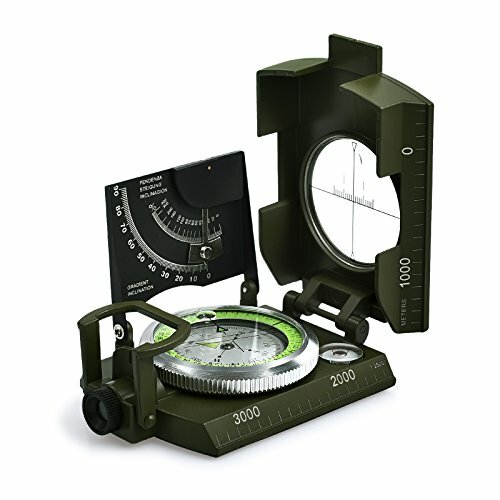 Once you have lined up the orienting arrow with the needle, look at the direction or degree indicated by the index pointer and the direction of travel arrow on the base plate of the compass. This shows you in which direction you are traveling.